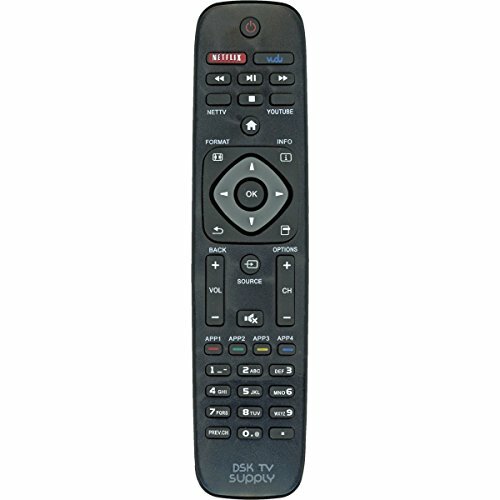 Replaces original Philips Remote Controls URMT41JHG003, URMT39JHG001, URMT39JHG002, URMT39JHG003, URMT41JHG006 and URMT41JHG010. Remote will work right out of the package for compatible Philips TV models listed without any programming. For detailed information on how to use this product with your TV, please refer to your TV's operating manual. Replacement for Remote Control Models: URMT41JHG003, URMT39JHG001, URMT39JHG002, URMT39JHG003, URMT41JHG006 and URMT41JHG010. No programming required. Batteries not included. Instructions not included or required for operation. If you have any questions about this product by DSK TV Supply, contact us by completing and submitting the form below. If you are looking for a specif part number, please include it with your message.